The Toyota RAV4 has been one of the premier small SUVs on the market for many years. One thing that sets it apart from its many competitors is the variety of trims. Although all of the 2018 Toyota RAV4 trims continue to share the same attractive body, these different trims do come with different features. For example, the top-of-the-line Platinum trim has high-tech LED headlights that are more powerful than traditional headlights. Also, the affordable LE trim has steel wheels while the other trims have alloy wheels. The exterior mirrors on the LE trim have power adjustability. The other 2018 Toyota RAV4 trims have mirrors with blind spot indicators. These mirrors are also power-adjustable for maximum convenience. The newly released Adventure trim also has unique black exterior styling cues that let everybody know you’re driving something special. If you live in the Tampa, Brandon or Wesley Chapel, you can check out all of the 2018 Toyota RAV4 Trims for yourself. Then, test drive your favorite at Toyota of Tampa Bay today. The Toyota RAV4 is so practical that you might not expect it to feature thrilling performance. However, the 2018 RAV4 is designed to exceed expectations. The standard engine across all trim levels is the peppy 2.5L 4-cylinder power unit pumping out 176 horsepower. A standard 6-speed automatic transmission is paired with this engine. A smooth CVT transmission is optional. Front-wheel drive is standard across all trims. All-wheel drive is optional across the 2018 Toyota RAV4’s trim range. Take the new 2018 Toyota RAV4 for a spin. Come to Toyota of Tampa Bay for a test drive today. The 2018 Toyota RAV4 is the perfect example of Toyota’s continued commitment to safety. Both the construction of the 2018 RAV4 and its complement of safety features ensure optimal occupant protection. The Toyota Safety Sense™ P package includes an extensive list of standard features across all trims. It includes a Pre-Collision System with Pedestrian Detection, Lane Departure Alert with Steering Assist, Automatic High Beams, and Dynamic Radar Cruise Control. The Star Safety System™ is also standard for all trims. This package includes Electronic Brake-force Distribution, Brake Assist, Smart Stop Technology®, Enhanced Vehicle Stability Control, Traction Control, and an Anti-lock Brake System. Front and rear parking sonar is optional on the XLE and Adventure trims and standard on the Platinum to help you avoid low-speed, close-quarters collisions. The 2018 Toyota RAV4 also comes with a new optional Bird’s Eye View camera, optional Rear Cross Traffic Alert and Blind Spot Monitor, all which work together to further enhance its standard backup camera features. Do you want to compare safety features on the 2018 RAV4 trim levels? Visit Toyota of Tampa Bay today for a test drive. Even a reasonably priced family SUV like the 2018 Toyota RAV4 can have a comfortable interior with a splash of added luxury. None of the trim levels, no matter how affordable they are, have a bare bones interior. All of the Toyota RAV4’s trims have a standard day/night rearview mirror that helps you see behind your SUV in low-light conditions. The LE has air conditioning with an in-cabin air filter to keep the air clean and pure. The other trims of the 2018 Toyota RAV4 have dual-zone automatic climate control. Of course, they also have air filters to ensure that you and your passengers are breathing in only the freshest air. The LE trim features a tough and ergonomically shaped urethane steering wheel. Both the XLE and Platinum trims upgrade this feature further with standard leather-wrapped steering wheels. The Adventure trim has a unique shift lever that makes shifting easier during the spirited performance and off-road driving. Most trims also include steering wheel mounted paddle shifters standard or as an optional feature. Check out the interiors of the 2018 Toyota RAV4’s various trims. 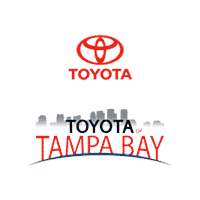 Visit Toyota of Tampa Bay today. All of the trims of the new 2018 Toyota RAV4, from the LE to the Adventure, feature Toyota’s proprietary Entune™ App Suite infotainment system. The high-end Premium trim has an audio system that music aficionados will be excited about. The JBL® system has 12 speakers that enable it to play your music with power and clarity. The XLE, Premium and Adventure trims all offer GPS navigation to ensure that you get where you need to go. If you live in the Tampa, Brandon or Wesley Chapel area, try out the tech in the new 2018 Toyota RAV4. Stop by Toyota of Tampa Bay dealership today and take a test drive.